I feel, this time the Oracle Magazine Jan/Feb 2012 has a special edition for who has received oracle excellence award. I am not added this list (excellence award) but My beloved teacher and my best adviser, Mr.Syed Jaffer Hussian included this list . Yes He got a Technologist of the year ,DBA 2011. Oracle always choose a right person to give this award. Again oracle proved, He has the right person for this award,2011. My personally, He has a great knowledge in Oracle and related OS. He is easily addict with who has newly meet him.He is very nice person and also he has continuously helping peoples, not only Oracle and at all. 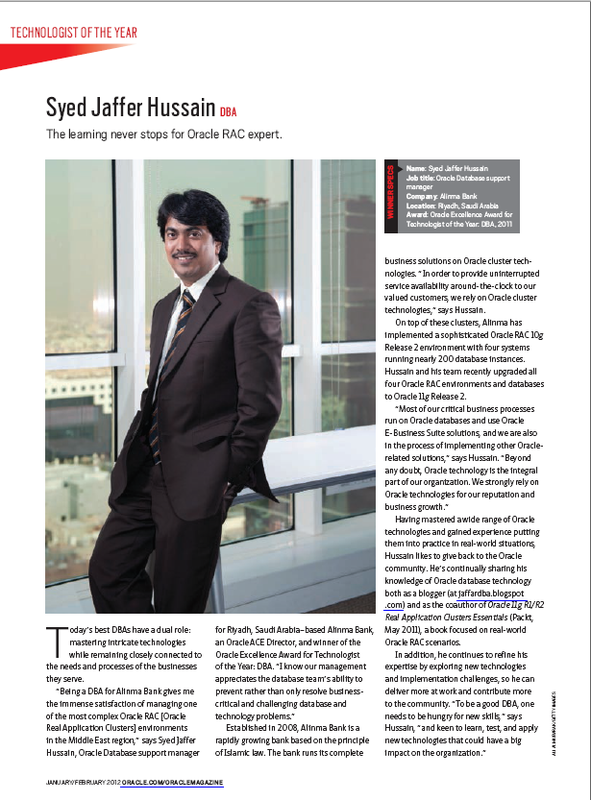 His interview is published at Oracle Magazine Jan/Feb 2012. I am very happy for this honorable person, Mr.Syed Jaffer Hussain got this award. Happy, Healthy & Successful life for him forever. Today morning I just written a small script for taking full database using datapump and after I scheduled on every one week with cron.